FACTORY CAB: Work in comfort from your climate-controlled cab and enjoy more space and panoramic views of your surroundings. Comfort is further enhanced through better noise insulation for a quieter interior. The interior includes an ergonomic control layout, IntelliPanel display, cup holder, deluxe suspension seat, abundant storage compartments and wide legroom for optimum operator comfort. BEST-IN-CLASS HST PLUS TRANSMISSION: Kubota’s transmissions are built by Kubota and specifically designed to maximize the speed and torque to meet your needs. Kubota’s electronic HST Plus Transmission includes advanced features that aid even the least experienced operators to look and feel like a professional while also turning difficult jobs into easy ones. 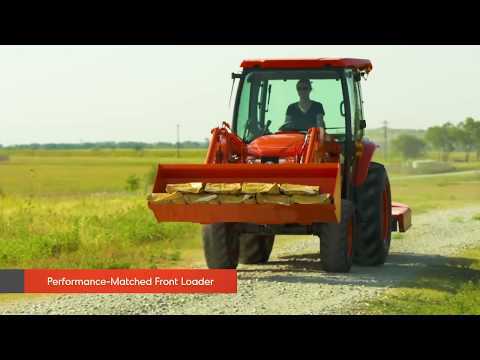 KUBOTA EXCLUSIVE FRONT HITCH: With two Kubota exclusive 4-point quick connect front hitch options, attaching front implements like blades, sweepers and snow blowers has never been easier. With a choice between manual and fully automatic front hitch, Kubota answers your needs for versatility. KUBOTA'S REPUTATION FOR QUALITY: Kubota is known for its quality, reliability and longevity. You can't fake a good reputation - it can only be awarded to you by your satisfied customers. KUBOTA VERSATILITY: With a huge selection of Kubota Performance Matched implements and attachments, Kubota has what you need to get your work done. No matter if it's a front end loader, backhoe, front or rear snow blower or a 3-point implement, Kubota has the right tool for the job. BUILT TO LAST: The L34560HSTC Limited Edition is designed and built with longevity in mind, keeping up with Kubota's reputation for quality, durability and reliability.